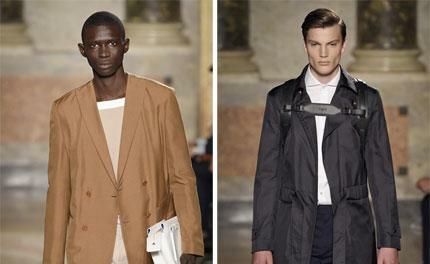 Ports 1961 creative director Fiona Cibani made a convincing case for khakis next spring. Cut into boxy, cropped jackets and billowy, straight legged pants, the khaki separates suiting took on a cleaned-up look in sturdy cotton twill, set off with brilliant white cotton shirting and leather tennis shoes. Cibani has settled comfortably into the neat and tidy men's sportswear niche over the last few seasons. Her mission remains singular and the formula quite simple: when you've got a suit on, no tie is required. When you've got a tie on, no suit is required. That means puddy leather jackets or jean jackets deflate a tie's formality, while a sharply cut suit will jazz up a pair of trainers and a simple cotton shirt.